This has been one of our most popular posts of all time here on iLibrarian, so we not only updated it, but new for 2014 – we’ve added a section with our favorite Comic Books and Manga apps!! There’s no shortage of book apps available for lovers of reading but you don’t need all of them. One can only read so much, after all. That’s why we’ve picked out the best of the best in reading apps. These are the ones with the largest libraries, best features, and the most bang for your buck. Check out our list to find out which ones made the cut. iBooks: Apple’s answer for books is every bit as awesome as you’d expect it to be. Use it to download classics and best-sellers from the iBookstore, then browse your library on a virtual bookshelf. Features include bookmarking, printable notes, quote sharing, and even multi-touch books designed for the iPad with interactive diagrams, photos, and videos. iBooks is fully integrated with iCloud as well, so your books and PDFs will be organized into your Collection, with bookmarks, highlights, notes, and more all up to date. UPDATE: Version 3.2 has a beautiful new design! Kindle: Amazon’s Kindle is a popular reading and multimedia tablet, but you don’t have to actually use the Kindle itself to enjoy the app. The Kindle app is available on Android, iPhone, iPad, Mac, PC, and even Blackberry, keeping your book collection handy no matter what your device du jour. Get access to millions of books, newspapers, and magazines in the Kindle store, plus email PDFs and other documents to your device with a Send-to-Kindle email address. Once you’ve got it on your app, it will be waiting for you in the Amazon Cloud and kept up to date, with highlights, last pages read, notes, and more, on all of your devices with Whispersync technology. Some of Kindle’s coolest features include instant dictionary word lookup and the ability to search inside each book for characters, topics, and sections. UPDATE: Amazon has made a lot of improvements in performance and stability for Version 4.1.2. Audible Audiobooks: Not everyone has time to actually sit down and read a book, but it’s still fun to lose yourself in a good read. Thanks to Audible’s Audiobooks app, even the busiest among us can find time to squeeze in a few chapters with audiobooks, enjoying books while working out at the gym, commuting to work, or even cleaning the house. Audible’s app offers thousands of audiobooks, from classics to bestsellers, and even news. You can even navigate through chapters with bookmarking, change narration speed, and set a sleep mode so you can fall asleep reading, making this an full-featured audio reading app. UPDATE: Now you can view full cover art from the iPhone player screen. Also, listeners can view book info and mark their title as “finished” directly from within the library. Tap and hold on the book in the library to access both of these features and select from the popup menu. Google Play Books: Another great reading platform, Google Play Books brings e-reading to your Android and iDevice with the immense power of the Google Books database. Google’s app has an impressive library, with more than four million books ranging from classics to New York Times bestsellers, including millions of free books. Plus, you can collect as many as you want with unlimited storage in the cloud. Reading on a few different devices? Google Plays has automatic page position syncing and even the option to read books offline. Once you’re done, you can archive books in their worry-free archive. Book Crawler: If you’re an avid book reader, you know it can be difficult to remember all of the books you’ve read and own. With Book Crawler, you can build a database of what you own, what you’ve already read, and which books you’d like to buy or check out from the library. This app allows you to upload your entire library just by scanning the ISBN barcode, so you’ll always know what you have. Plus, when you search for a book, you’ll be able to find summaries, reviews, and even library availability, making it easy to find your next great read. When you’re ready to read, Book Crawler allows you to link your favorite e-Book reader to get access to digital copies on your device. UPDATE: Now you can download Dropbox files in Web access mode. The latest version will also eliminate the display of multiple editions in lists on the iPad. Nook: Nook earns a spot on our list because it’s ridiculously customizable. If you’re particular about the way your ebooks are displayed, this is the app for you. You can change the color, font, spacing, brightness, and margins to minimize eye strain and create your own ultimate reading environment. There are, of course, all of the usual features that you’d hope to have in an ereader, with notes, book search, dictionary lookup, highlights, and more. UPDATE: The newest version has added Time Magazine as well as over 200 college newspapers. Goodreads: The Goodreads site has become a staple for 21-century book lovers, with more than 10 million members adding more than 300 million books to their shelves. You can take Goodreads mobile with this app, using it to discover and share books not just for yourself, but with your friends. We love all of the possibilities offered, from keeping track of what you want to read, complete with a barcode scanner that you can use in stores, to adding books to your reading history so you’ll never forget the stories you’ve loved. Plus, Goodreads maintains popular book lists, so you can discover books not just from your friends, but from readers worldwide. Book Writer: Fancy yourself a writer? Create your own ebook on the go with this app. You can add text, photos, video, music, and even record your voice into the book, then share it via iTunes or email. Prefer a hard copy? You can create the book as a PDF and print it out. It’s perfect for baby books, journals, or budding writers. Shakespeare: Sure, you could lug around several heavy books in your bag and read all of Shakespeare’s extensive plays, sonnets, and poems. Or, you could save yourself the broken back and download this app instead. Enjoy the complete works of Shakespeare in painstakingly high-quality, plus awesome features including detailed scene breakdowns, word search, glossary, quotes, and even portraits of the man himself. Free Audiobooks: Another great resource for book lovers on the go, Free Audiobooks has nearly 5,000 different audiobooks available for a one-time app purchase. Public domain books come to life with the app’s beautiful original covers, and you’ll never have trouble finding a book to listen to, thanks to handpicked collections including Epic Epics, Mystery, and War. Instapaper: We’ve all found long articles, emails, and blogs that we’d love to read, but just can’t sit through right this second. But, you don’t want to forget about them, either. With Instapaper, you don’t have to. You’ll be able to save web pages for later offline reading, plus browse articles in Editor’s Picks, or that your friends have posted on Facebook, Twitter and Tumblr. But that’s not all. When you save documents on Instapaper, you can enjoy distraction-free reading environment, losing most ads and layouts for an optimized view that puts the text first. UPDATE: The latest version allows subscribers to send items to the Kindles. Bluefire Reader: For the independent reader, Bluefire Reader is a great app, allowing you to read iPUB and PDF ebooks from around the world on a singular reader. It has almost all of the great features that the big guys have, with definition lookup, bookmarking, highlighting, exportable annotating, and even the option to share excerpts via email, Facebook, and Twitter. Plus, if you have way too many books to keep track of, or just want to get organized, you can put your books into different collections. New for 2014: OverDrive Media Console: Access a collection of eBooks and audiobooks from a library that never closes! This OverDrive app makes it possible to connect to more than 22,000 libraries worldwide on your on iPad, iPhone, and iPod touch. So why not connect to your local library and borrow eBooks and audiobooks for free! OverDrive Media Console enables you to place holds, create wish lists, and return titles easily. A valid account with a participating library, school, or other institution is required. New for 2014: Kobo: This free eBooks app lets you read and sync eBooks across devices. Access a vast collection of more than 4 million eBooks in a variety of topics via the Kobo store, including 1 million free titles. Kobo makes reading social with the ability to share quotes, notes, and book reviews with friends on Facebook. Users can also take part in the Kobo community and earn awards, track how long it takes to read a book, and more. 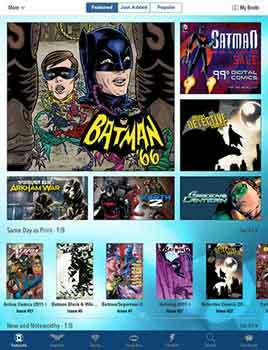 Comic Zeal Comic Reader: Organize your digital comic books collection on your iPad with Comic Zeal which allows you to load and sync your comics using USB, wifi or other apps like Dropbox. 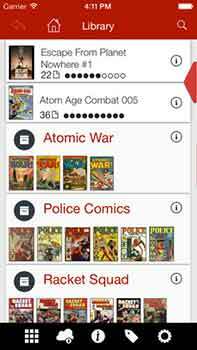 This helpful app lets you search for and find your comics by title and the tags that you’ve applied to them, create reading lists, and create series and dividers. 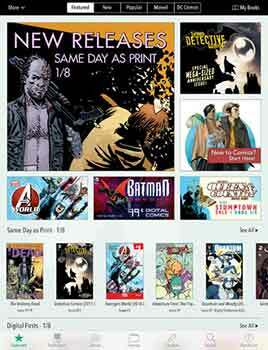 Comics by comiXology: This fantastic — and free! 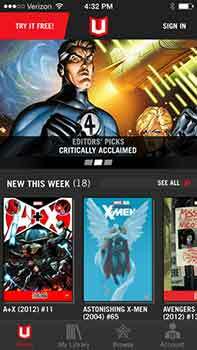 — app is a virtual comic books stand offering the ability to purchase current comic book issues via your iPad. Comics offers a robust collection of over 45,000 digital comics and graphic novels from publishers such as DC, Marvel, Image, Disney, IDW, and others the same day as print releases. Marvel Unlimited: This app is free for subscribers who pay for a Netflix-like subscription to Marvel Unlimited – Marvel.com’s back catalog of 13,000 issues. While this won’t include the latest issues, you do get access to 70 years of Marvel’s greatest comics such as Captain America, Iron Man, Deadpool, X-Men, etc. DC Comics: DC Comics is the largest North American comics publisher with well-known superheroes such as Superman, Batman, Wonder Woman, Green Lantern, The Flash and many more. Access a giant comic book store dedicated exclusively to DC’s titles with 80 new comics available monthly and more than 1,000 comic books and graphic novels published annually. 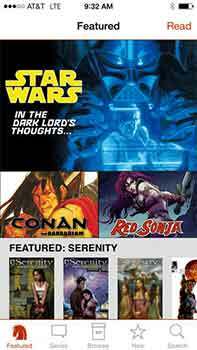 Dark Horse Comics: Access a digital comic book store offering Dark Horse’s collection of 3000+ comics with titles that you can’t find elsewhere such as Buffy, Star Wars, Hellboy, Serenity, Conan, and many more. Dark Horse offers many free and low cost titles starting at .99 cents. Manga Rock 2: This is one of the most popular tablet manga readers available with more than 2 million downloads since 2010. 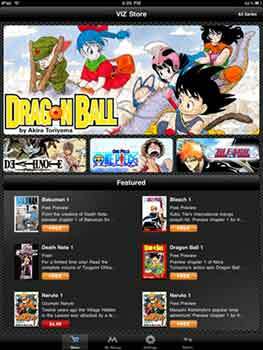 Access manga in seven different languages and customize your reading experience with their advanced settings offering the ability to read both right to left and left to right as well as horizontally and vertically. Create a favorites list, keep track of what you recently read, and backup and restore your manga through their Manga Rock Cloud. VIZ Manga: Access Japan’s greatest manga titles such as Naruto, Bleach, Death Note, Vampire Knight, One Piece, Dragon Ball, Bakuman & hundreds more via this all-in-one app. 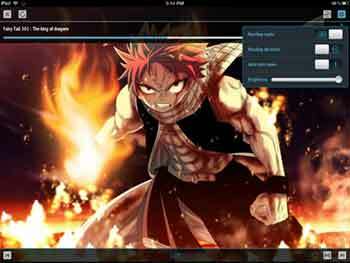 Comparable to apps such as Comics from ComiXology for American comics, this specialized app aggregates manga titles from a variety of sources all accessible in one place.